We are one of the well recognized VNA Truck Manufacturers, Exporters and Suppliers in Tamil Nadu. These VNA Trucks are designed as per the set standards by using most advanced technology. These VNA Trucks are known for their efficient performance and optimum functioning. The clients can avail the VNA Truck from us in varied specifications and models at affordable price. Large-screen LCD display shows high-definition images with Electric energy display, timing, fault display and excellent digital display functions which are convenient for operators to understand the conditions of the forklift truck and for maintenance. Its goods hoisting plant getting the national patent makes operators adjust the hoisting speed according to requirements in the practical operation, which has greatly improved the work efficiency. 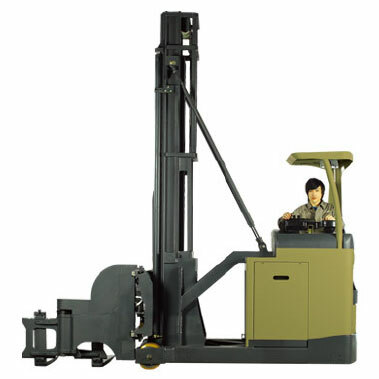 The hoisting height-locating device getting the national patent makes operators set many heights when fetching to decrease the tiredness of operators and increase the work efficiency. The storage battery translation motion device getting the national patent, during the maintenance of storage battery, can avoid lifting and ensure drivers safety. The big steering bearing getting the national patent, which is self-developed according to the international advanced technology, its rear drive assembly integrated with variable speed box, wheel box and steering bridge ensures flexible turning and excellent running performance. Its upright mounting system realizes trial-direction fetching and placing of goods when the upright mounting does not work, which increases its stability and safety.